Today, I was referred to this article. It is really inspiring and interesting. Values in his life has moved him up. Living leaders who can make changes in our career. Defects in software... a day to day affair in software professional's life. But good to know that there are some volunteers as a group who work on common errors and security defects of software. All these listed errors range from component unit level validation to XSS, SQL injection etc. Approach to avoid such defects and errors are also available in the portal. This is much useful. Earlier I have seen OWASP Top 10 defects (Open Web Application Security Project). Both these list covers majority of the common security defects. Above benefits, there can be some adverse effect on releasing this list. To know more read this link. I feel every software architect and developer be aware of this list and need to prevent the occurrence of these defects in their development. Today, early in the morning, I learnt a lesson. A lesson from a monkey. A monkey climbing the ladder. At 05:45 in the morning after my daily routine, I was at the terrace of my house. It was wonderful scene to watch. The cool air, first light of sun, the biophony of city and cloudy sky - made me to feel like heaven. While gazing around I saw some monkeys on the terrace of another house, couple of houses away. There was one active monkey among them, looking curiously here and there. It is neither too small nor too old, should be in its adolescence. Every other monkey was busy in taking fallen mangos on the floor from the side tree. But this monkey didn’t do that, rather had a purpose in its movement. This young monkey wanted to climb on the water tank. There was an iron ladder rested on the wall. It went near the ladder, took two three cautious steps on the first steps of ladder. Then stopped at that level and shook ladder with its arms. It looks as if it is checking the strength of the ladder. Of course, it did check. When it gained confidence, it climbed up fast without any hesitation and reached the top. Reaching there it was looking around attentively. Do every one getting up? Are the street lights switched off? Is the traffic signals switched on? Are the joggers doing brisk? When it got satisfied it came down silently. It touched my chord. A monkey, an animal, thinks and double checks before it start acting. On confirmation, it remain focused and did what it wanted. I remember this quote - "I was busy climbing up the ladder. On the top, I realized that it was on the wrong wall" Now, is my ladder rested on the right wall? 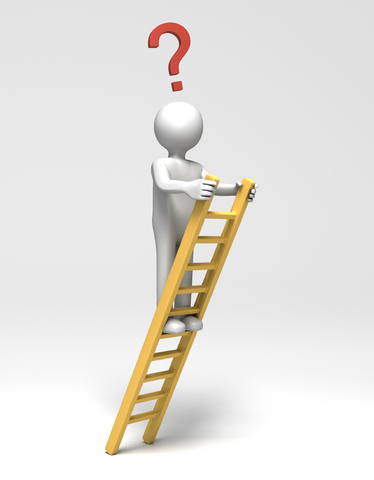 Is my ladder strong and firm? Am I really climbing up? I am going to introduce very useful app for your blackberry. It is Blurts. Certainly it is not a, yet another app. Blurts is a tool that enables you to control your Blackberry through your PC. It has very good, exciting features. With Blurts, now, I can make a call from my laptop, I can attend / ignore call through my laptop, send SMS, grab the screen image of the BB etc. Now phone calls are not disturbance, when I work with my laptop. With blue-tooth headset connected - its a fun to have conversation while your hands are at work. Of course, it has some bugs. Rarely, it is not getting connected easily, requires a restart of the app. The usability of the PC interface can be improved a bit. Otherwise, it is no nonsense app, works fine with me for the past two months. One more important point - you need to pay for the Pro version. Paying couple of dollars will not be a matter considering the features offered. 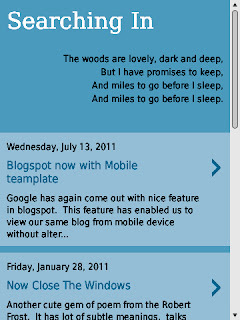 Google has again come out with nice feature in blogspot. 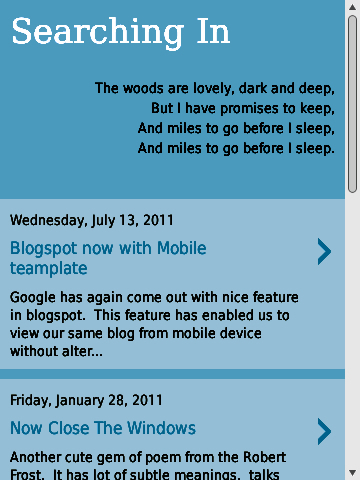 This feature has enabled us to view our same blog from mobile device without altering anything in your existing template. Just need to enable mobile template option in your settings > email/mobile tab of dashboard. You can scan your URL through given bar-code image. This is a Flickr badge showing public photos from BKSHAN. Make your own badge here. Shanmugavel -. Watermark theme. Theme images by A330Pilot. Powered by Blogger.